Oh ya this deliciousness is even happening on top of fresh avocado. In my house I roast off beats once a week because I put them in everything from sandwiches to salads and they are so good for you. Beets help fight inflammation, increase blood flow, are packed full of antioxidant betalains, and are a good source of Vitamin C and folic acid! I love prepping marinated portobellos and beets because you can re-purpose both for an amazing sandwich for your lunches. 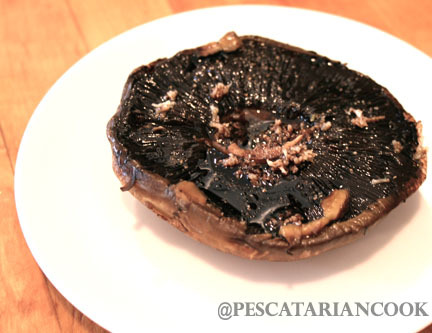 You can do these two components side by side in the oven because they do bake at the same temperature, but you will want to start the marinating process at least an hour before you start cooking so that all of the portobello gets marinated. Take your portobellos and remove the stem. Place them gill side up in a baking pan. I usually roast about 4 at a time so I use a 9×13 size baking pan. Drizzle them with olive oil so that the gills are evenly covered. Then drizzle them with balsamic vinegar. I usually put enough to try to fill the natural cup of the mushroom half way. It is okay if both the olive oil and balsamic spill over into the pan because it will infiltrate the bottom of your portobello. Next micro-grate fresh garlic cloves over the top of each mushroom cap. I use 1 clove per 2 caps and then use my fingers to rub it into the gills. Lastly top with cracked pepper. Let these sit and marinate in the for about 20 minutes. Now you can either bake these or throw them on the grill (2-3 min per side). I will normally bake them if I am baking beets too. They will go in the oven on the top rack at 375 degrees for about 15-20 min. You will know when they are done when they are nice and juicy and a bit smaller. Take them out of the oven and let them cool. Then you can either slice or cube the portobellos in preparation for the salad. So secondly I roast the beets. I wash them real good and then cut the tops and bottoms off and place them in a small baking dish with enough water in the bottom to cover the bottom of the beet. I then cover the dish with foil and place in then oven at 350 degress for about an hour. You will need to check half way through and add more water if needed. 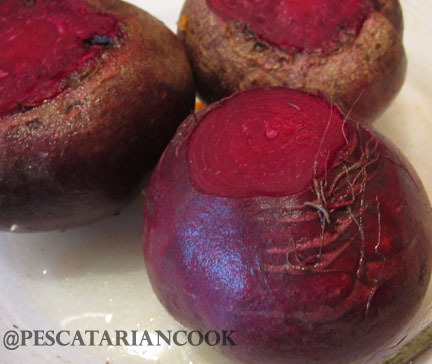 They are done when you can stick a fork easily into the body of the beet. Now you can let them cool and peel them if you like under cold water. I actually like the earthiness of the peel so I just slice them as they are. For this salad you will slice them into rounds. Now its time to mix it up into an amazing salad. Mix together the slices or cubes of portabello with equal parts of sliced beets. Let the juices of the portobellos fall into this mixture. Then stir them slightly. Next build your salad. 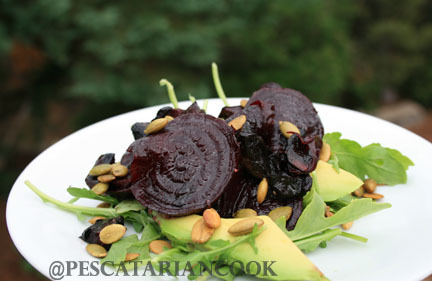 I used a base of fresh arugula leaves, sliced avocado and then topped that with the marinated portobello and beet salad. I love pumpkin seeds so I finished the salad with a handful of shelled roasted pumpkin seeds. Enjoy!